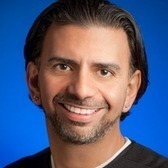 Jaime Casap is an Education Evangelist for Google. He will be one of several big-stage speakers this week at the GlobalMindED Conference this week, June 9 & 10 in Denver, on access, equity and opportunity. The purpose of the conference is to level the playing field for students who are economically disadvantaged, bringing them the professional skills and networks of people who can help them achieve their goals. As a first generation college graduate himself, Jaime is one of the best role models for the educators, entrepreneurs, and activists in attendance, and most of all for the diverse class of first-generation student leaders. I am even more honored to have him join our movement knowing more about his background and the advantages he created for himself despite--and arguably because of--his challenging path. What is your First Gen story? My daughter tells it in an amazing way. I was born in NYC to a woman who came to the US from Argentina to escape an unstable government and poverty. I was raised on welfare and food stamps in Hell's Kitchen, NY, which at the time was not the community you find today with all the nice restaurants and expensive condos. I grew up in the Hell's Kitchen of the 1970s and 80s, an era in which it really lived up to it's name! Hell's Kitchen was not a nice place. I grew up watching friends I knew since elementary school turn into drug addicts, criminals, drug dealers, and watched them cycle through Riker's Island year after year. I wanted out of Hell's Kitchen. Riker's Island was certainly not for me, and I rejected the narrative that my destiny was to become a drug dealer, criminal, or that I too would be a frequent Riker's Island visitor. Through hard work, God's grace, and the help of some amazing teachers, I graduated from high school. However, being the stubborn person I am, graduating from high school wasn't enough for me. I remember looking at the college graduation statistics, which were around 5% for Latinos. I refused to accept those stats. It became an "I'll show them" mission. I needed to prove myself! So without any help, I looked at colleges. I had already missed the fall semester deadlines so I committed to start in the spring. I figured out how to fill out the applications and the financial aid forms. I knew we had a great state system so I applied to a few schools outside New York City and ended up at SUNY Brockport (near Rochester), where I graduated with a double major BA in Political Science and Communications. How has being First Gen influenced your life path and purpose? I believe deeply in education because in my heart I know it has the power to disrupt poverty and to change the destiny of a family in just one generation. I see my kids and the life they have, and I know they are going to be ok and I know their kids will be ok. That is the power that education has, and I don't think we are taking it seriously enough. What I think about each day I wake up is that if you are a high-potential Latino or African American kid living in poverty, you have a 9% chance of graduating from college. What advice do you have for First Gen students in college, and once they start their career? Whenever I talk to first-generation students, the first thing I want them to understand is that I believe with all my heart that if I can accomplish what I've accomplished, they certainly can. I am no different than they are. I was in their shoes and I know their struggle. I know what they must overcome and I tell them with a lot of hard work, a healthy disrespect for the "impossible," some luck, and a nice pair of reality distortion glasses, they can accomplish anything! The second thing I tell them is something I wish someone shared with me when I was in their shoes. I was ashamed of who I was. I was ashamed of my family and where I came from. I did not share my experiences with folks. I felt if they knew I was poor, they would assume negative stereotypes about me. I tell first-generation students I was wrong! I tell them that who they are, where they are from, and their perspective and experiences will be enormous competitive advantage when they make it out and find their way in the world! They need to be proud of who they are and their experiences. Those experiences define them and they should walk proudly. What is your vision for a diverse and equitable world? What do we need to do to create that? This is a deep and complicated question. More than anything, I want to see an understanding of what it will take to get to real equity, and a commitment of resources to make it happen. When I get asked, "how did you make it out?" I often say it was getting my education, working hard, and some luck. Everyone who has the same experience will tell you the same thing. What I would like to see is a de-emphasis on luck. Luck shouldn't be a requirement to escape poverty. At the end of the day, when the door of a classroom closes, the most important factor in a kid's life is having a great teacher in the classroom. We need the best teachers serving the students who need it the most! We know what we need to do. Now we need the resources to do it. We need the commitment to do it. We need to understand that education drives our economy, and as our country becomes more diverse, education becomes even more important. The grit, persistence, and indomitable spirit palpable in Jaime's story reflects the gathering this week of 600 thought-leaders at GlobalMindED. Together, we are committed to the collective impact strategies that unite us, no matter how different our backgrounds, to provide a culture--a rich ecosystem--where millions of young people develop the same verve, nerve and discipline as Jaime to reject what they can't accept and to create the world of cooperation, respect, curiosity, competence, and opportunity that is their birthright.